An acoustic camera approach to studying nasality in speech: The case of Polish nasalized vowels. The Journal of the Acoustical Society of America (JASA), vol. 144(6). (Lorenc, A., Król, D., Klessa, K.). Link to publication. Aspects of gestural alignment in task-oriented dialogues. Cognitive Studies 2018 (18). (Karpiński, M., Czoska A., Jarmołowicz-Nowikow, E., Juszczyk, K., Klessa, K.), DOI: 10.11649/cs.1640. Download. Methods, tools and techniques for multimodal analysis of accommodation in intercultural communication. In: Computational Methods in Science and Technology (CMST), Vol. 24 (1) 2018, 29-41, DOI: 10.12921/cmst.2018.0000006 (Karpiński, M., Klessa, K.). Speaking style variation in laboratory speech: A perception study. Proceedings of the 9th Speech Prosody Conference, June 2018, Poznań (Klessa, K., Karpiński, M.). Download. Timing patterns variability in Latgalian read speech. In: Jardar Eggesbø Abrahamsen, Jacques Koreman, Wim van Dommelen (Eds.) Nordic Prosody XII. Peter Lang. (Klessa, K., Nau, N., Orlovs, O.). The structure of Polish nasalized vowels: results based on spatial energy distribution and formant frequency analysis, In: Zygmunt Vetulani & Patrick Paroubek (Eds.) Proceedings of The 8th Language and Technology Conference, Poznań, Poland. (Lorenc, A., Klessa, K., Król, D.) Download. The perception of non-native phonological categories in adult-directed and infant-directed speech: An experimental study. Proceedings of 50th Annual Meeting of the Societas Linguistica Europaea (SLE 2017), Workshop on Modelling the acquisition of foreign language speech: old meets new, 10-13.09.2017, University of Zurich, Switzerland (Karpiński, M., Klessa, K.). Annotation Pro. Enhancing analyses of linguistic and paralinguistic features in speech, Wydział Neofilologii UAM, Poznań. ISBN 978-83-946017-0-6. (Klessa, K.) Download. Polish rhythmic database – new resources for speech timing and rhythm analysis. Forthcoming in: Proceedings of 10th International Conference on Language Resources and Evaluation (LREC). 23-28 May 2016, Portorož, Slovenia (Wagner, A., Klessa, K., Bachan, J.). Download paper. Analiza wybranych cech zmienności iloczasowej w różnych stylach wypowiedzi na podstawie korpusów nagrań dla technologii mowy. Prace Filologiczne, vol. LXIX, str. 215-235 (Klessa, K.). Języki w niebezpieczeństwie: księga wiedzy (2016). Nau. N, Hornsby, M., Karpiński, M., Klessa, K., Wicherkiewicz, T., Wójtowicz, R. (Eds. ), Wydział Neofilologii UAM, Poznań, ISBN 978-83-947198-4-5. Dokumentacja języków [w:] Języki w niebezpieczeństwie: księga wiedzy, Nau. N, Hornsby, M., Karpiński, M., Klessa, K., Wicherkiewicz, T., Wójtowicz, R. (Eds. ), Wydział Neofilologii UAM, Poznań, ISBN 978-83-947198-4-5. Download or read on-line. Przegląd wybranych aspektów analizy prozodii mowy spontanicznej na potrzeby technologii mowy. Prace filologiczne, vol. LXVI/2015, str. 271-298 (Wagner, A., Bachan, J., Klessa, K., Demenko, G.). Prosody and gesture in dialogue: Cross-modal interactions. Proceedings of 4th Gesture and Speech in Interaction (GESPIN) Conference, Nantes, France (Czoska, A., Klessa, K., Karpiński, M., Nowikow-Jarmołowicz, E.). 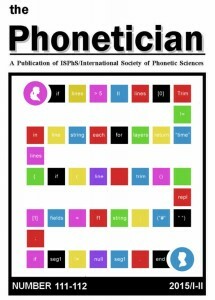 Perception of Polish Neutral and Affective Speech by Native and Non-native Listeners, Proceedings of The 18th International Congress of Phonetic Sciences, Glasgow, UK. (Klessa, K., Oleśkowicz-Popiel, M., Owsianny, M.) Download link. Polish Infant Directed vs. Adult Directed Speech: Selected Acoustic-Phonetic Differences, Proceedings of The 18th International Congress of Phonetic Sciences, Glasgow, UK. (Czoska, A., Klessa, K., Karpiński, M.) Download link. Annotation Pro. Új eszköz a beszéd nyelvi és paranyelvi sajátosságainak címkézésre és elemzésére, Beszédkutatás (Speech Research Journal). Research Institute for Linguistics of the Hungarian Academy of Sciences. Budapest (Klessa, K. Markó A.) Download PDF of the journal issue. Design and Implementation of an On-line Database for Endangered Languages: Multilingual Legacy of Poland. In: Input a Word, Analyse the World: Selected Approaches to Corpus Linguistics. Francisco Alonso Almeida, Ivalla Ortega Barrera, Elena Quintana Toledo and Margarita Sánchez Cuervo (Eds. ), Newcastle upon Tyne: Cambridge Scholars Publishing, ISBN (10) 1-4438-8513-4. (Klessa, K., Wicherkiewicz, T.). Prozodia niepewności. In: Sens i brzmienie, Danielewiczowa M., Bilińska J., Doboszyńska-Markiewicz K., Zaucha J. (Eds. ), Wydawnictwo Uniwersytetu Kardynała Stefana Wyszyńskiego, Warszawa, Preprint version (in Polish) available for download at Academia.edu (Karpiński, M., Klessa, K.). Open access data and open educational resources help to save endangered languages. Open Science: Your guide to Open Access, available at: http://openscience.com/open-access-data-and-open-educational-resources-help-to-save-endangered-languages/ (Klessa, K., Wicherkiewicz, T.). Annotation Pro + TGA: automation of speech timing analysis, Proceedings of the 9th Language Resources and Evaluation Conference, Reykjavik, Iceland. ISBN 978-2-9517408-8-4 (Klessa, K. and Gibbon, D.). Download paper. Languagesindanger.eu – including multimedia language resources to disseminate knowledge and create educational material on less-resourced languages, Proceedings of the 9th Language Resources and Evaluation Conference, Reykjavik, Iceland. ISBN 978-2-9517408-8-4 (Jung, D., Klessa, K., Duray, Z., Oszkó, B., Sipos, M., Szeverényi, S., Várnai, Z., Trilsbeek, P. & Váradi, T.). Download paper. Computational annotation-mining of syllable durations in speech varieties, Proceedings of the 7th Speech Prosody Conference, 20-23 May 2014, Dublin, Ireland. ISSN: 2333-2042 (Yu, J., Gibbon, D., Klessa, K.) Download paper. Local and global convergence in the temporal domain in Polish task-oriented dialogue, Proceedings of the 7th Speech Prosody Conference, 20-23 May 2014, Dublin, Ireland. ISSN: 2333-2042 (Karpiński, M., Klessa, K., Czoska, A.) Download paper. Compilation of Language Resources and On-line Dissemination of Knowledge about Endangered Languages and Linguistic Heritage. Proceedings of The Sixth Baltic Conference Human Language Technologies (HLT) – the Baltic Perspective. Kaunas, Lithuania, 26-27 September 2014, pp. 192-195 (Klessa, K., Nau, N.). Go to download page. Duration and speed of speech events: a selection of methods. In: Lingua Posnaniensis 2014(1), Special Issue in Honour of Prof. Piotra Łobacz, pp. 59-84, DOI: 10.2478/linpo-2014-0004, (Gibbon, D., Klessa, K., Bachan, J.) Download page, download link. Book of Knowledge of Languages in Danger. EN: (website publications in Polish and in English: languagesindanger.eu/book-of-knowledge/, PL: pl.languagesindanger.eu/book-of-knowledge/) (Nau, N., Hornsby, M., Karpiński M., Klessa, K., Wicherkiewicz, T., Wójtowicz, R. (Eds.)). Annotating paralinguistic features in quasi-spontaneous speech. Adding the “vision” component? [in:] Proceedings of Workshop on Vision and Language, December 13th and 14th, 2012, University of Sheffield, UK (Klessa, K., Karpiński, M.). An Investigation into the intra- and inter-labeler agreement in the JURISDIC database. Speech and Language Technology, 2008, vol. 11 (K. Klessa, J. Bachan). LVCSR speech database-JURISDIC. In Signal Processing Algorithms, Architectures, Arrangements, and Applications (SPA), 2008, pp. 67-72. IEEE, 2008 (Demenko, Grażyna, Stefan Grocholewski, Katarzyna Klessa, Jerzy Ogórkiewicz, Agnieszka Wagner, Marek Lange, Daniel Śledziński, and Natalia Cylwik). Development and Evaluation of Polish Speech Corpus for Unit Selection Speech Synthesis Systems. Proceedings of Interspeech 2008, September 22-26, 2008, Brisbane, Australia. (Demenko G., Bachan, J., Möbius, B., Klessa, K., Szymański, M., Grocholewski, S.). A Preliminary Study of Temporal Adaptation in Polish VC Groups. Proceedings of Speech Prosody Conference, Campinas, Brasil, 2008. (Malisz, Z., Klessa, K.). The design of Polish Speech Corpora for expressive speech synthesis in BOSS system, PPEE Conference 2007. (G. Demenko, K. Klessa, M. Szymański, Jolanta Bachan). A Study of Chosen Temporal Relations within Syllable Structure in Polish, First presented at SSAPS Conference in autumn 2006, Poznań, published in 2007 in Speech and Language Technology, vol. . ( K. Klessa, D. Śledziński). Download paper. Identification of Nuclear Melody Placement in Polish Read Texts, Proceedings of Prosodic Interfaces, Nantes (Baranowska, E., Francuzik (Klessa), K., Karpiński, M., Kleśta, J.). Parametryzacja zbioru danych dotyczących iloczasu głoskowego na potrzeby syntezy mowy, Speech and Language Technology, vol. 7, Poznań, (K. Francuzik (Klessa)). Interphrase Pause Realization Rules for the Purpose of High Quality Polish Speech Synthesis, Proceedings of SASR, Szczyrk (Karpiński, M., Kleśta, J., Baranowska, E., Francuzik (Klessa), K). Klasyfikacja samogłosek polskich za pomocą sieci neuronowych w wymowie dzieci niesłyszących. (Classification of Polish Vowels Using Neural Networks). Audiofonologia (t. XXIII/2003) (Łobacz, P., Grygiel, W., Baranowska, E., Francuzik (Klessa), K.). Determining boundaries in written texts for the purpose of Polish speech synthesis, [w:] Demenko, G., Karpiński, M. (Red.) Speech and Language Technology, vol. 7 (2003), Wyd. PTFon, 71 78. (Baranowska, E., Francuzik (Klessa), K., Karpiński, M., Kleśta, J.). A Preliminary Study of the Intonational Phrase, Nuclear Melody and Pauses in Polish Semi-Spontaneous Narration. Speech Prosody Proceedings, Aix-en-Province, 2002. (K. Francuzik (Klessa), M. Karpiński, J. Kleśta) Download paper. Acoustic-phonetic description of Polish vowels: teen-age deaf speech, Psychology of Language and Communication t. 6, zesz.2. (P. Łobacz, K. Francuzik (Klessa), E. Szalkowska).